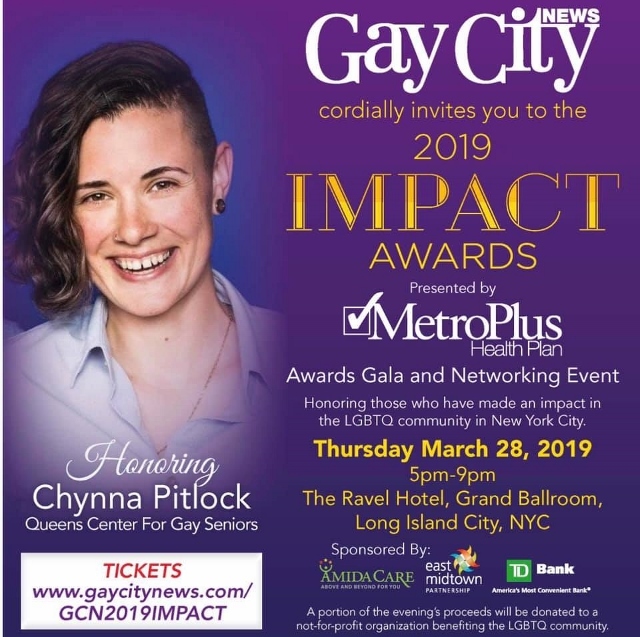 Our Queens Center for Gay Seniors (QCGS) Director, and fierce social justice advocate, Chynna Pitlock, was recently selected to be honored at Gay City News’ Impact Awards for her work in the LGBTQ Community. In 2010, Chynna moved to New York to attend SUNY College at Old Westbury where she was recruited to play on the Women’s Soccer team. During her time at Old Westbury she became involved with the campus LGBTQ student club ‘PRIDE’ and soon after became the president. During her years as president, she supervised over fifty student members and a four-member Executive Board. She organized educational programs for the Old Westbury Undergraduate community and staff on LGBTQ issues and rights. In her graduating year, she received ‘Student Leader of the Year.’ On top of this honor, the Center for Student Leadership and Involvement at SUNY Old Westbury honored Chynna as being one of the fifty most influential student leaders in the last decade. In 2013 she graduated from SUNY Old Westbury with a Bachelor’s degree in Psychology and a minor in Social Work where she received high honors. Upon graduation, she accepted a job as a Youth Specialist working with incarcerated LGBTQ youth in Brooklyn, helping youth adapt back into their communities and families. Chynna joined Queens Community House (QCH) in 2014 as the Assistant Director of Queens Center for Gay Seniors, the borough’s only LGBTQ Senior Center. A year later, she took on the role of Director. In this new role, Chynna has been instrumental in expanding outreach, community awareness and advocacy for LGBTQ older adults in the borough of Queens. She’s currently responsible for the daily operation of the center, which provides a culturally-rich environment where LGBTQ older adults can engage with peers, enjoy a hot meal, take classes, explore new interests, and give back through volunteer and advocacy opportunities. In 2015 Chynna pursued her Master’s Degree at Silberman School of Social Work at Hunter College. During her time at school, her thesis involved creating an Intergenerational LGBTQ program curriculum which aims to create a mentoring program between LGBTQ senior and youth center participants. She received her Master’s in Social Work with a Concentration on Aging and Clinical Work in May 2018, graduating with high honors, and was inducted into the Golden Key International Honor Society. Chynna is on the board of the Lesbian and Gay Democratic Club of Queens and is an active member of Queens Pride, the producers of the second largest LGBTQ Pride Parade in NYC. Throughout her work in the borough of Queens, Chynna has been recognized and honored by the Queens Borough President as well as numerous Council Members for her work with the LGBTQ community of Queens. Chynna has a strong passion for LGBTQ activism and advocacy, believing in the strength of education and diversity outreach to dismantle social inequities. She is proud to be an out queer social worker and looks forward to continuing her leadership within the LGBTQ community.